de Deus Church, Saligao and Menezes Braganza Hall, Panjim will be resounding with the voices of the Stuti Choral Ensemble and the magic of stringed musical instruments. Mixing well with the heavenly showers, the concerts conducted under the baton of Parvesh Java will be presented at Mãe de Deus Church, Saligao on July 11, 2018 at 7pm and at Institute Menezes Braganza, Panjim on July 12, 2018 at 7pm. Inspired by the rhythm of the monsoons, the programme will include instrumental and choral music by Handel, Rachmaninoff and Goan composers. The highlight of the show will be Franz Schubert’s Mass in G. Parvesh Java, originally from Mumbai, currently lives in Goa. He has been conducting the Stuti Choral Ensemble and the Goa String Orchestra for the past three years. He is the Director of Con Brio, an annual classical music festival held at NCPA in Mumbai. Stuti Choral Ensemble was founded by Fr Eufemiano Miranda, the president of the choral ensemble in October 2009. Since then, it has performed at various venuesincluding churches in Goa. They also performed at Kala Academy, Panjim, Maquinez Palace, Panjim and Clube Harmonia, Margao. 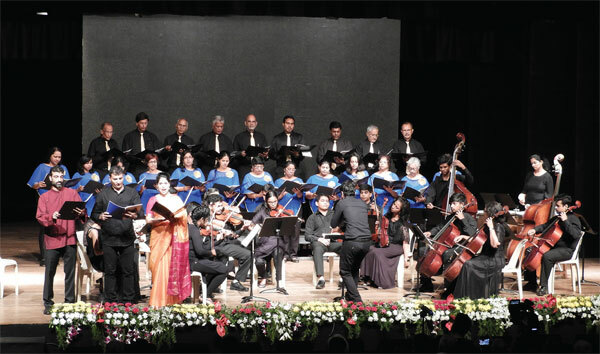 They performed at St Mark’s Cathedral, Bangalore in response to an invitation from the Deccan Herald along with the Bangalore School of Music and at the Monte Music Festival along with the Goa String Orchestra at Old Goa, organised by Fundação Oriente. This will be the third concert by Stuti Choral Ensemble for the year, after their first concert at the Ketevan World Sacred Music Festival in March 2018 followed by the Lenten concert. The members for this concert include Sopranos Kay D’Souza, Patricia Sequeira, Arati Fernandes, Sheena Pereira, Anija Luis, Maryann D’Mello, Melissa Dias Sapeco, Monalizza Lobo, Ornella Menezes and Grisha Costa. The Alto voices will be Elaine da Costa, Corina Fernandes, Judith da Costa, Kate D’Souza, Lima Barreto, Lourdes Coutinho and Snaysha Fernandes. The Tenors will be Fr Eufemiano Miranda, Orlando Vaz, Gerard D’Mello, Joe D’Mello and Glen Dias and the Bass voices will be Antonio Vas, Tony Dias, Agostino Fernandes, Abednego Pinto, Benny Maciel, George De Souza, Jason Quadros and Mervin de Souza. The string quartet accompanying the choir will be Frederika Cotta and Eshvita Menezes on violin, Gorette Pinheiro on viola and Jennifer Son (USA) on cello. Winner of Con Brio Piano Competition 2017, Sonam Lodhi (Pune) will be on piano. The programme for the two musical evenings will include ‘F Schubert’s Mass in G’, ‘Handel’s Trio Sonata for 2 violins and cello’, ‘Rachmaninoff’s Piano Trio’ and ‘Shostakovich 5 pieces for two violins and piano’. The concert will also have three Konkani hymns, ‘Piedade Saibini’ arranged by A C Vas, ‘Deva Tuje Dovlotichi’ arranged by Rev Mo Lourdino Barreto and ‘Maiê Kaklutin Gê Bhorlolê (Pav Maie)’ with lyrics and music by Micael Martins.